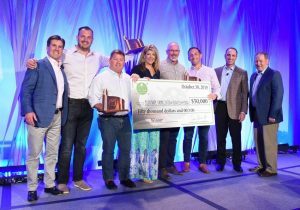 foursome from JLT – winners of the White Plains/Albany, NY regional event – was crowned champions of the 19th annual tournament, and will present their winnings, a $50,000 check to Berkshire Farm Center & Services for Youth. the $900,000 raised has already been distributed to charities across the U.S. and Canada. The post Berkshire receives $50,000 donation from JLT Specialty USA after winning 19th Annual Chubb Charity Challeng appeared first on Capital Region Chamber.